You are buying VetriScience Feline Renal Essentials Bite Sized Chews For Cats 120ct, model #0900662120 at ADW Diabetes, we offer a wide range of pet dietary supplements geared towards helping your pet achieve optimum health. We offer these supplements in both single and discounted bulk packs with the goal of helping you save even more. Shop with ADW Diabetes for all of your pet health supplement needs. 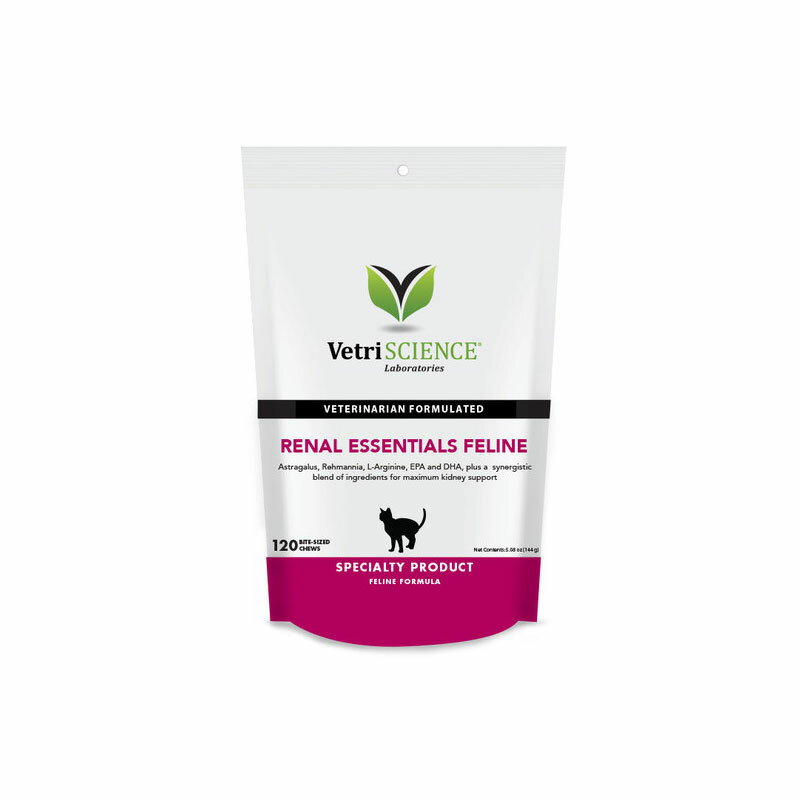 The VetriScience Feline Renal Essentials Bite Sized Chews For Cats 120ct help maintain proper kidney function by supporting renal circulation, normal fluid retention, normal detoxification, stress management, homocysteine balance, and kidney and liver function. The inclusion of astragalus root powder supports kidney circulation and immune function, while the Chinese herb rehmannia supports kidney and liver function, and is known as the "kidney's own food." Other ingredients like vitamins B1 and B2 support metabolic activity, including the metabolism of proteins, fats, and carbohydrates, supporting proper energy production. Folic acid, DMG, B12 and B6 help support methylation and sulfuration pathways, while minerals like potassium are important for water balance. B vitamins are water soluble and not properly recycled during times of kidney stress or dysfunction; therefore, supplementation may be required. Ingredients: arabic gum, brewers yeast, calcium sulfate, chicken liver flavor, citric acid, citrus pectin, fish oil concentrate, glycerin, maltodextrin, mixed tocopherols, oat flour, oat meal, propionic acid, rosemary extract, rye flour, silicon dioxide, sodium alginate, sorbic acid, soy lecithin, vegetable oil, water.